Download the event brochure online. UCCA is a historic Bauhaus-style museum, originally constructed as factory chambers in the early 1950s. 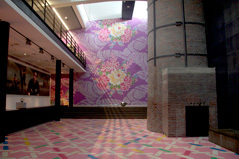 While the UCCA spaces retain traces of their industrial past, they are also capable of hosting large-scale international exhibitions and events. Designed by architects Jean-Michel Wilmotte and Qingyun Ma, and featuring a new door facade by architect Yung Ho Chang, the 8,000m² UCCA building encompasses 4 main exhibition spaces (the signature Great Hall, the Central Gallery, the Nave, and the Long Gallery) as well as 5 multi-purpose spaces for corporate rental (the Pavilion, the Atrium, the Auditorium, the Workshop, and the Salon). All of these spaces boast professional lighting as well as climate and humidity control, providing the ideal venue for an artistically expressed, high-caliber event. Whether you are planning a one-on-one meeting, arranging a board meeting or conference, launching a new product, organizing team-building activities, or celebrating a special event, our event team will ensure that UCCA meets your every need. The Pavilion is the newest addition to UCCA’s corporate rental spaces, featuring a 360 m2 floor space and ceilings 9.14 m tall at the lowest point. 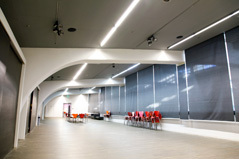 The Atrium is located in the east section of the first floor, with a total area of 183 m2 and 9.14 m high ceiling. 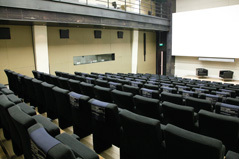 The Auditorium is a space of 180 m2, fully equipped as a professional theater and press conference venue. 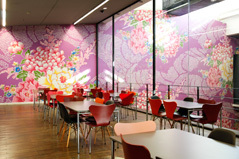 The Workshop is a bright, spacious room on the second floor of UCCA with a floor space of 218 m2and 3.9 m high ceilings. The Salon is an exclusive, private room 90 m2 in area with 3.9 m high ceilings. 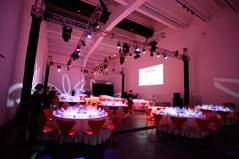 It is ideal for a variety of smaller-scale events. 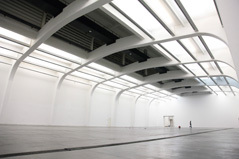 With a floor space of 1,525 m2 and an arched ceiling 9.14 m tall at the lowest point, the enormous Great Hall is the most striking and popular space within UCCA.